Ok so the back story is this. I landed an online code interview with a company that shall remain nameless. I know I am not ready for a job there but I was basically given the chance by an insider. Anyways below is a picture of the question. My question is two fold.. first is the questions in the picture... if anyone can answer them.... and my other question is...if a micro-controller fails or something goes wrong and it stops working then how does it do a memory dump? seems to me that it would require it to be in working order to execute something like that. otherwise youll just get the memory dump of what things looked like "before" the crash. The memory dump in question was not taken at crash. It was taken for debuging. 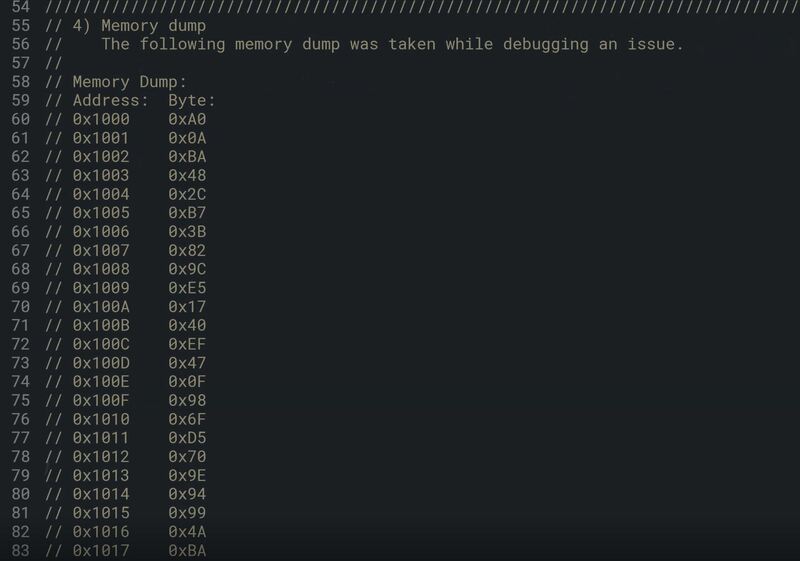 A memory dump 'at crash' is created for a software error (exeption) detected at runtime by the program or debugger. The question is simple. 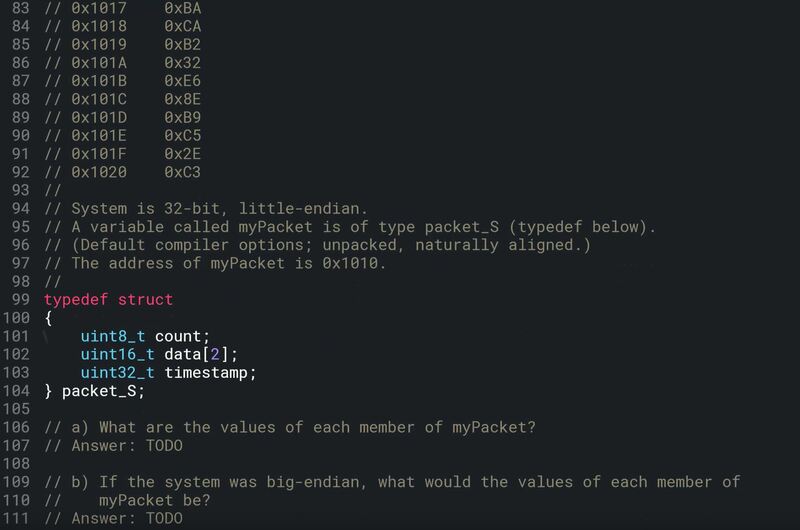 The 'dump' contains a memory occupied by an instance of the struct packet_S. You need only interpret the bytes into data types of member variables. And the struct is very simple. It takes 1 + 2*2 + 4 bytes. The content of the struct starts at 0x1010 so count is 0x6F. This is not affected by 'endianes'. The ints and the long are affected by byte ordering, so you need to interpret them for A and B. This is a bit of a trick question. Without structure packing each element will be aligned to a 4 byte boundary. This means there are quite a few padding bytes in the structure. Even though these are not zero, their value is irrelevant. Also note that the compiler cannot reorder the elements in the struct. This information means the structure's memory layout is well defined. if a micro-controller fails or something goes wrong and it stops working then how does it do a memory dump? It generally doesn't. Doing a broad memory dump of all of RAM is risky, because under many microcontroller architectures, doing a read from certain SFR addresses has unintended effects, so you can't naively iterate through indirect addressing over all of the RAM address space. If this is something you really, really need, one option is to rig up a 1980s-style microcontroller with an external memory bus and a watchdog. If the watchdog times out, have a secondary post-mortem microcontroller that saves the RAM contents to an EEPROM chip (or whatever). Not the answer you're looking for? Browse other questions tagged microcontroller embedded memory firmware dump or ask your own question. What physical tool to use to quickly dump firmware?